Who doesn't love a good picnic in the summertime? I know I do! We like to pack up a picnic and head to our local state park every now and again for lunch and trail hiking. We'll take light foods since we'll be walking a few miles after lunch, so we usually whip up sub sandwiches or turkey wraps. 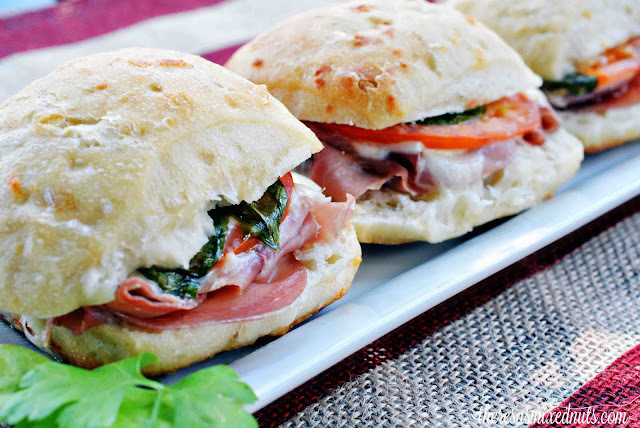 I thought I'd do something a little different for our next picnic and make some mini ciabatta sandwiches. Jason is a huge fan of ciabatta bread and Italian meats, so I knew he was going to LOVE these Baked Italian Paninis from Golden Blossom Honey. Don't let these mini sandwiches fool you. What they lack in size, they more than make up for in flavor! 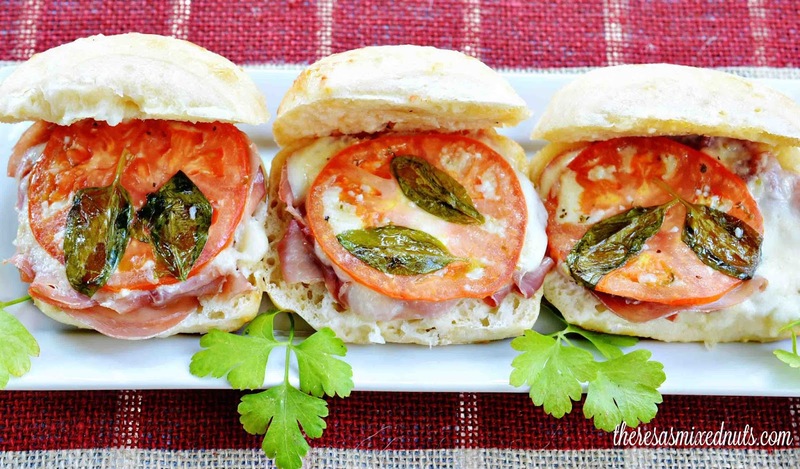 Prosciutto meat, gooey melted mozzarella, tomato, and herbs makes this a fantastic picnic option. Mariah joined the Greenhouse Club last year and we ended up with quite a few herb plants. I was happy to be able to pluck some basil right from the pots on my window sill, all grown from my own daughter's hand, making this sandwich all that much more special. Do you plan on going on a picnic this summer? We will picnic anywhere! Usually on our back deck, but usually at the beach or the state park on weekends. Bugs do know how to ruin a picnic, don't they? This looks delicious! I bet the dressing is sweet, tangy, and flavorful! Sounds like a great addition to a panini. Oh, that looks so good! This is classic summer! I love making sandwiches and other dishes with our tomatoes when they come in. I love paninis! This one looks so good, I may have to try this recipe soon. The size actually is a huge selling point for me. Who wants to stuff themselves when it's this hot out? Aside from the perfect sizing, the ingredients are heavenly. Can't wait to picnic with these. This Baked Italian Paninis looks so yummy. We like to pack a picnic lunch when we go to the beach. This does look great! I have oregano and could add my home grown basil to this. We probably will go on a picnic soon. I now see the basil is in it. I love a good panini and the addition of fresh herbs. These would easily be the star of any picnic. This is such a great idea for Summer picnics. Thanks for sharing this excellent panini recipe! I am always looking for new sandwich ideas and this one looks delicious! I love that your daughter grew the herbs. I like panini sandwiches, they are healthier! I will try this, so perfect for our movie night. Oh wow these sound absolutely delicious - I am totally trying these for lunch soon! This would be a delicious picnic spread. I wil have to give this a try. This looks so delicious and refreshing. I need some new summer recipes! Mmmm, do those every look yummy! I love panini sandwiches! Save me a sandwich! I am loving how you added extra flavor to this dish with honey. I have never actually tried that before on a sandwich! How fun that you got the herbs from your daughter's growing. Fun! I think melted mozzarella makes a sandwich and I agree w/your husband, ciabatta bread is awesome. These sandwiches look like a great option for lunch. We have not been on a picnic in so long! Thee sandwiches make me want to take the family on one right now. Omg, this is so perfect I really wan this for our snack time.